Just regular folks. : Back from New Mexico. We have been home for only a few hours - back from a spring break trip to New Mexico and Austin, TX. This New Mexico trip was inspired by Katherine, Jeremy's mother, who has always wanted to live in New Mexico and loves being in New Mexico. She bought some property almost a decade ago in conjunction with the Nature Conservancy and now is ready to build herself a home on the property near Gila, NM. I have never seen Katherine so happy, making plans for her house and watching all of her grandchildren play together in the cold snow-melt rivers and getting dusty every day. Gila, NM is not very close to anything, it was a 3.5 hour drive from the El Paso airport where we flew into. 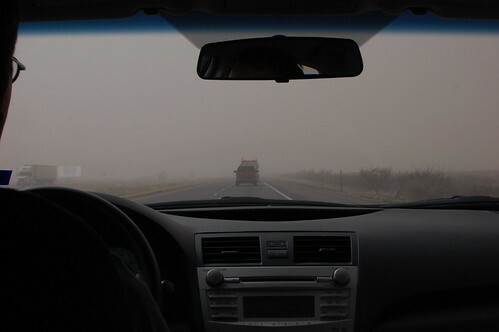 We were stymied by a dust storm which forced road closures and we detoured around the road closure which added another 2 hours to the trip. 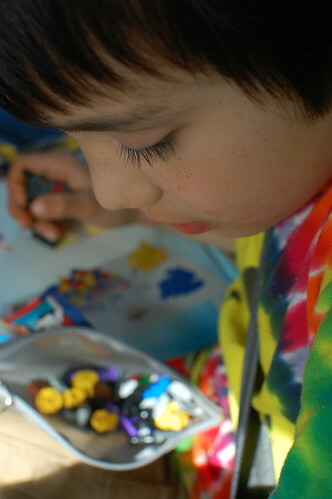 We were saving a box of Legos for Vince to build once we got to our bed and breakfast, but at some point, he was really frustrated with the drive, so we opened it in the car, hoping that the pieces wouldn't be sucked into all the crevices. We finally made it to our little cottage which is about 4 miles off the main road on a little dirt path. 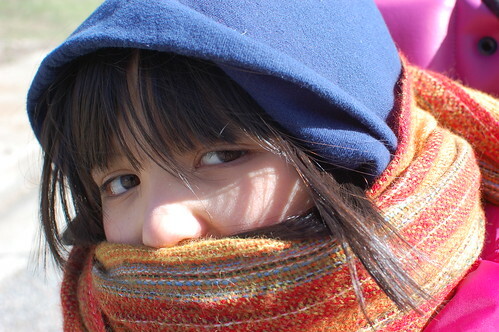 The next day, we visited Fort Bayard, and even thought it was really sunny, it was really, really cold. We did not pack very well for the cold mornings. Edda, in particular, would have appreciated some gloves. As we left Fort Bayard, we noticed that the town's coffeehouse was hosting a showing of birds of prey. We saw a captive golden eagle and a peregrine falcon. The golden eagle can kill a sheep. Yikes. 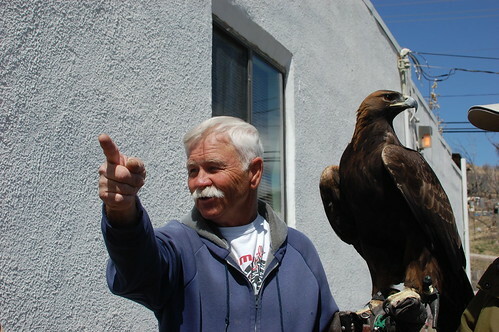 The golden eagle is an endangered species and normally not allowed to be trapped by private citizens, but there is someway of obtaining a golden legally and Zoltar's owner spent a long time telling us how he got the permits to have a pet golden eagle. Boy was it lonesome in our house when I got home from work today. Way, way too quiet. We miss you guys! When we were in IAD Airport yesterday, we heard your name from Airport Load Speaker. Dad called you and I guess it was different Doris. Sorry to miss you by one day. See you in three weeks or so.